Gitenberg is a collaborative, open source community curating and publishing highly usable and attractive ebooks in the public domain. Our books are free to use by anyone for any purpose. They contain detailed metadata and are accessible in a wide variety of formats. 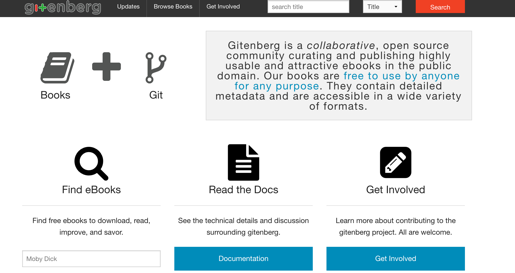 GITenberg is a prototype that explores how Project Gutenberg might work if all the Gutenberg texts were on Github, so that tools like version control, continuous integration, and pull-request workflow could be employed. We hope that Project Gutenberg can take advantage of what we’ve learned; work in that direction has begun but needs resources and volunteers. It’s hard to believe, but GITenberg started 6 years ago when Seth Woodworth started making Github repos for Gutenberg texts. I joined the project two years later when I started doing the same and discovered that Seth was 43,000 repos ahead of me. The project got a big boost when the Knight Foundation awarded us a Prototype Fund grant to “explore the applicability of open-source methodologies to the maintenance of the cultural heritage” that is the Project Gutenberg collection.